One of the ways to enjoy century eggs is in this classic century egg pork congee. A popular Chinese breakfast food, you can find it at hawker centres, market food stalls and dim sum restaurants. They are a Chinese delicacy made of preserved duck, chicken or quail eggs. 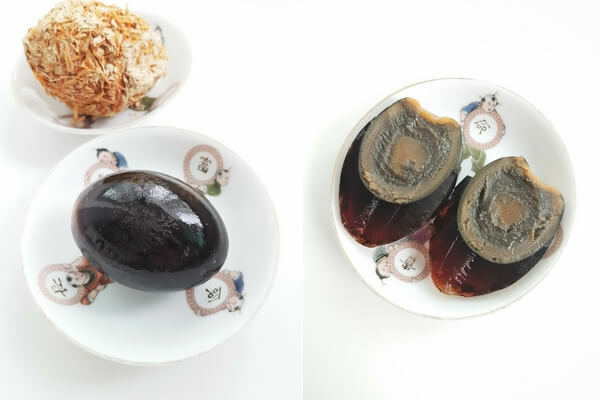 Century egg or pídàn (皮蛋) is also known as hundred-year egg and thousand-year egg. Contrary to its name, they have not been preserved for a thousand years nor even a century. They are preserved using a mixture of clay, ash, salt, lime, and covered in rice hulls for several weeks to a few months. This process turns the yolk to a creamy texture with a strong flavor while the whites of the egg turns dark, jelly-like but with very little taste. 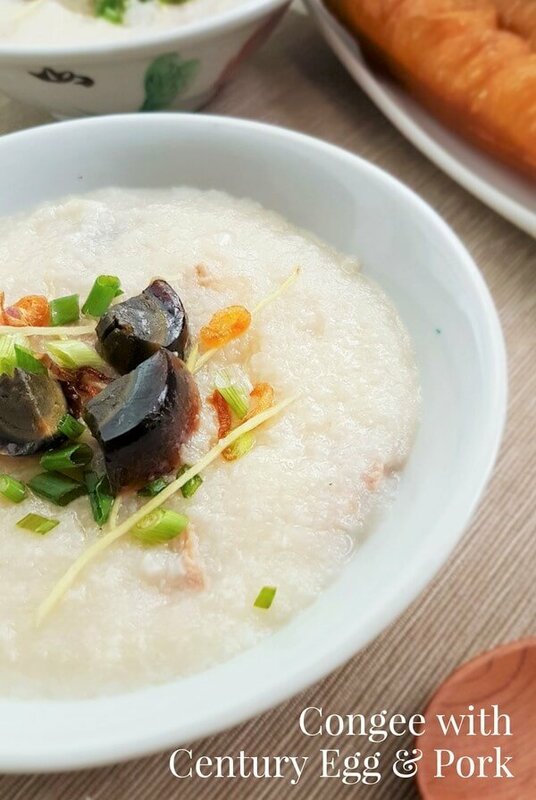 If you’ve never eaten century eggs before, this century egg pork congee is a good introduction to their unique taste. 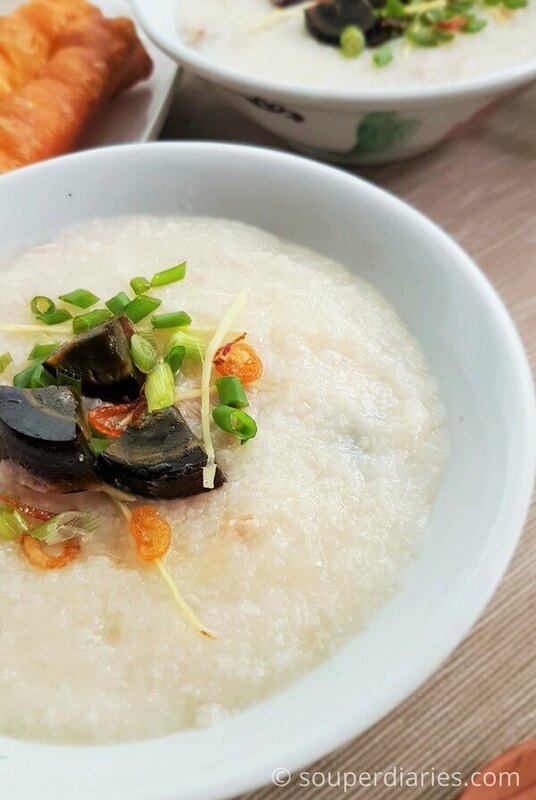 The flavorful congee helps to mask the strong aroma of the century egg. I really love the combination of the smooth congee with the creamy century egg and all the different garnishes. The strips of ginger also helps to cut through the taste of the creamy and pungent century egg. To make congee, you can cook with frozen rice, soaked rice or pre-cooked rice. Use what is convenient for you. I tried all three methods and the results from the first two are quite similar. Pre-cooked rice though will take a shorter time to cook (especially if you blend the cooked rice). It doesn’t matter which method you use. The key to a smooth congee (without the aid of any blending tools) is to stir the congee frequently. This helps the starch to break down more easily and shortens the cooking time. The rice to water ratio is important too. For this recipe, I used a rice to stock ratio of 1 : 7 as I don’t like my congee to be watery. Use more stock ( 8 cups of liquid to 1 cup of rice) if you prefer the congee to be thinner. You can use any type of pot to make congee. Some rice cookers come with the porridge/congee function too. 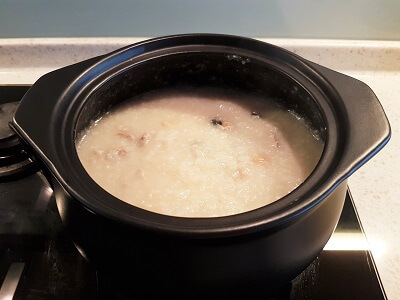 Other ways to cook congee include using slow cooker, thermal cooker and even pressure cooker. I love using my claypot to make congee. I took less than an hour to cook this congee as it was almost lunch time. Can’t keep Rui, my lil boy waiting for his meal. Even though the cooking time was quite short, I’m happy with the taste and texture. If you want the grains to break down further, you’ll need to boil it for a longer time, add more stock and stir frequently. I used a single grain (jasmine white rice) but a combination of grains can be used too though I read that the latter will take a longer time to cook. Stir the congee every now and then to prevent it from sticking to the bottom of the pot. I stirred more frequently towards the end of the cooking time. Add the diced century eggs and pork only when the congee is almost ready. If you add it too early, the pork will overcook and turn tough and chewy. Would you like to become a food blogger like me? Or are you passionate about other hobbies/niche that you would like to share? Learn how to create your own website and much more at Wealthy Affiliate. There’s a 7 day trial that is absolutely FREE! Find out more here. 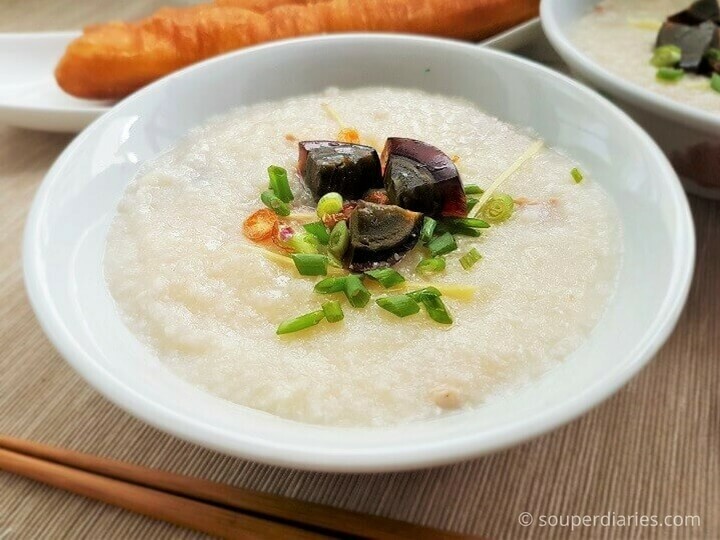 Century egg pork congee is a classic Chinese food. Heat up stock in a pot till it boils. Meanwhile, marinade the frozen rice with oil and salt. Mix well and set aside. When the stock starts boiling, put in frozen rice and dried scallops. Lower heat to medium and stir occasionally to prevent the rice from sticking to the bottom of the pot. Cook for about 40 minutes or longer depending on your preferred consistency. When the congee is almost done, add lean pork slices. Stir awhile before adding diced century egg. Cook for another 5 to 8 minutes and stir frequently. Taste and season the congee to your preference with salt or soy sauce. Garnish with sliced ginger, spring onions and fried shallots. Drizzle with a little sesame oil. (Optional) : Serve with you tiau. 1. Add more stock to the congee if you find it too thick. 2. You may use mixed grains of rice too. 3. Stir frequently if you want a shorter cooking time. I made some congee early this week as if my body was telling me that I needed it for my cough. Guess what, when I went to see the doctor, he told me to eat water from the porridge as it has electrolytes or to drink Pocari. I’ve heard about drinking the liquid from porridge before to help cool down one’s body. Usually when I have cough, I will boil a herbal drink with dried apricot kernels (南北杏 (nán běi xìng). I’ve not heard of Pocari before. Thanks for sharing. I am not a big fan of century egg but a big fan of jook. I can eat pork congee all day. It’s absolutely delicious! I see you have fried dough in the background of the picture, do you eat that with your congee too? I tried to do congee with pressure cooker and it was delicious. do you have any tips reagarding to do the cooking with pressure cooker? Sorry but I’ve not tried cooking congee with a pressure cooker. This looks delicious and I’d love to try it but I don’t think I’d like to try duck eggs because I’m rather fond of ducks. They make great pets! Just wondering, are you a vegetarian? I really liked the recipe and I want to try it out but I do not eat pork so will the dish turn out the same without it? I understand pork is one of the major ingredients but I have not been eating it and try avoiding it so can you suggest some other alternative instead of the pork that I can use? You can cook congee with other types of meat too like chicken, fish, beef, etc. For fish congee, add them only when the congee is almost ready as it cooks fast. If you have leftover roast meats, you can also use it to add in the last stages of cooking congee. Thanks for stopping by! Centenarian eggs! what a pleasant memory in a Chinese restaurant in San Francisco’s Chinatown, was an indescribable impression, I did not know what kind of egg was that, but I do not remember the name of the dish. Next time I will ask century egg pork congee to take your advice to savor this egg with something that pleases me like congee. Can you order In a Vietnamese restaurant?